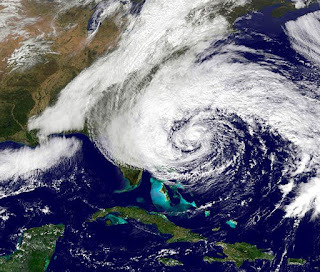 With hurricane Sandy bearing down upon the eastern coast of the United States there are a number of things people can do to protect their homes and family from danger and disaster. Make sure you have sufficient food and water to last up to 2 weeks. It may take that long to get electricity restored to your home if you lose power. Try to stock up on foods that don’t require cooking and are not perishable for at least a couple of weeks. Wash out your tubs and sinks and then fill them with fresh water. You may want to use a plastic liner in the tubs and sinks to hold the water. Make sure you’ve stocked up on fresh batteries and that you’ve replaced the old batteries in your flashlights and AM/FM radios. Also keep candles and a lighter nearby. Make sure you have your grilles propane tank filled as you may have to resort to cooking on your gas grille. Also make sure to have your portable gas tanks full if you’re lucky enough to own a generator. Similarly, fill up your automobiles’ gas tanks. Pick up and store away in garages or sheds any children’s toys, patio furniture, and other yard items that could be blown away or destroyed by hurricane Sandy. You may also want to remove the grille cover and store it away as well. Make sure your cell phones are fully charged prior to the onslaught of hurricane Sandy, as your cell phones maybe your only form of communication to the outside world if the land lines get taken down by hurricane Sandy’s high winds. If you own a generator check the oil and gasoline in it and start it up. If it doesn’t start or runs rough clean the spark plug and try again. Also have the generator wiring handy so that you can easily access it in the dark. Also, always make sure to operate the generator outside and at least 30 feet away from your home. Often during natural disasters banks and ATM machines are not open or not operational. Consequently it’s a wise idea to have some cash on hand to make emergency purchases. I often get asked what exactly is Ice and Water Shield. When I first started receiving this question I was somewhat shocked that people were unaware of this roofing product. Ice and water shield has been a godsend in the housing industry for years now. It is used for protecting homes and roofs from water and ice damage and every responsible builder and roofer uses it today. edges and in the valleys, and along walls or chimneys to protect against ice dams and water seeping underneath flashing. Ice and water shield is commonly sold in 3 foot width rolls. Typically one or two courses of it is installed along the roof eaves to achieve 3 to 6 feet of coverage. In the roof valleys it is usually positioned so that there is about 18 inches of coverage on either side of the valley. Where a roof abuts a wall the ice and water shield is typically installed up the wall 6 to 18 inches. House siding is then installed over it. So if you are having your roof reshingled make sure that the roofing contractor includes the installation of ice and water shield in the quote. This weekend I visited a home improvement center looking for a new deck railing system for my home’s deck. After checking out several deck railing systems I’ve decided to use Fiberon’s composite deck railing system. The composite railing system pieces are constructed using a PVC core with a very hard PVC finish that resists scratching and fading. I plan to install the Fiberon deck railing system in the next few weeks, while the particular home improvement center is offering a 10% sale on all decking materials. This is the time of the year to get deck material discounts, so if you have a deck project in mind you may want to find out if you can get similar price saving deals at your local home improvement center for your deck project. The composite deck railing kits from Fiberon come in a couple of different standard lengths, e.g. 6 and 8 feet. Each kit comes with top and bottom rails, balusters, and the hardware to assemble them. You can also trim the standard lengths to the required widths. They also have a special railing kit for stairs. In addition, I needed to buy post sleeves, cap, and skirts. For a 12x10 deck I calculated the total cost of the Fiberon deck rail system to be about $550. I’ll be sure to write about the project when I complete it, as well as take plenty of pictures and a video or two during the deck construction. So check back to see how the project went and to see the finished look. If you’re home has drafty windows the fall season is the perfect time of the year to have them replaced. Though you’ll have to outlay some serious money for installing replacement windows, the energy costs savings are significant. Based on the rising trend in energy costs you should be able to recoup your costs within a reasonably short period of time. In addition, if you plan to sell your home at some point down the road, the replacement windows will significantly help your cause and most likely enable you to sell the home for a higher price. So stay warmer this winter by investing in your home and replacing your old and drafty windows. 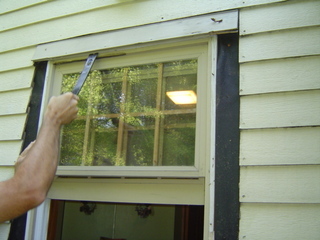 For free window replacement contractor quotes just fill out the Window Replacement Quote form at HomeAdditionPlus.com. 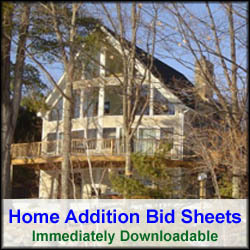 Home Addition Bid Sheets and Contractor Hiring Guides. If you have plans for any of the following home improvement projects and plan to hire a contractor make sure to purchase the appropriate bid sheet / contractor hiring guide from HomeAdditionPlus.com first! You won't regret it!! I installed a Deluxe FreezeAlarm this weekend at my vacation home. I installed another one several years ago on another home and loved it. This neat little box calls you if it detects the temperature in your home is too cold or hot, if there is a power outage, or if the backup battery is too low. In addition, it can support a couple of additional sensors, e.g. water, motion and contact sensors that can trigger it to call you. It can be programmed to call up to three phone calls in the event of an alarm condition. You can also call it to get a temperature and power status of your home. What I really like most about the Deluxe FreezeAlarm is that it can be used to remotely control the temperature of your vacation home or cabin via a simple phone call. The Deluxe FreezeAlarm can accept two thermostat inputs and output a signal to activate the heating furnace. Consequently you tie your existing thermostat into it and wire up a secondary thermostat that feeds it as well. You then set the existing, or primary thermostat, to say 70oF, and the secondary thermostat to say 50oF. When you’re not at the home for an extended period of time you set the Deluxe FreezeAlarm to operate off of the secondary thermostat so that the home stays at a cool 50oF. Then, an hour before you get home, you simply make a phone call to the box, which has a phone jack that plugs into the back of it, and tell it to switch to the primary thermostat. When you arrive at your home, your house is toasty 70oF warm. At the time of this writing the Deluxe FreezeAlarm costs under $200. Consequently it pays for itself in very short order, compared to what you’d pay for with a monthly home monitoring service. It’s also simple to plug in and install. All you need is a power outlet and a phone jack nearby. If you want to wire up the device to control the temperature of your home, then you’ll also need to feed it two thermostat signals and connect up a signal wire between the box and the heating furnace. The Deluxe FreezeAlarm is manufactured by Control Products Inc., and can be found at various home improvement centers and online stores.